Schrodinger’s Telephone, a new novella, is available exclusively as a e-book through Amazon. This quick-read story is being offered for less than a cup of coffee (only 99 cents) and can be read on your Kindle, I-Pad, PC, tablet, phone, etc. “Regardless of what we call it or how we categorize it, Schrodinger’s Telephone is a quick and engrossing read that will exercise your mind. How would you react if someone you knew insisted that something impossible had happened? Click here to see read a sample. 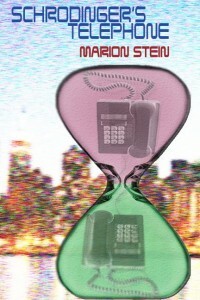 I just finished reading Schrodinger’s Telephone and what a wonderful read it was. Even a cynical old man like me with no discernible faith in anything found it moving, heart-breaking, challenging and uplifting in equal measures. Thank you Marion. Awesome. Thank you so much. If you could manage a short review on the Amazon UK site that would be a great way to tell other readers. With pleasure. I’ve posted a review on Goodreads as well. I hope many more folks get to discover it.